Flan | Dessert Darling from the Farmer’s Market. I was excited to try the original and banana flans that she brought to book club since they sounded legendary. Perhaps my expectations were too high though, because I didn’t quite understand the big to-do. 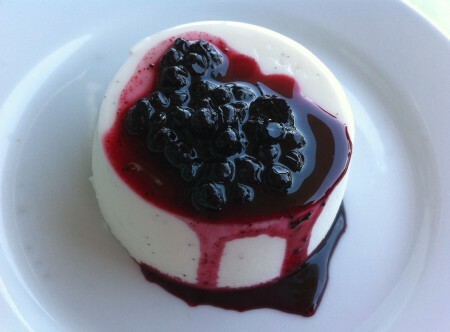 Sure the flan was fine, but not necessarily greater than any other flan I’ve tried before. I had an underwhelming experience with the Flan King which inspired me to buy the next flan I saw, a packaged product in Whole Foods by Signature Flan. The package claims it’s “made with real ingredients.” Well that‘s reassuring. Already, I thought we were off to a sketchy start. I peeled back the plastic wrap and was even less dazzled by the congealed surface of generic-looking, pre-packaged dessert. One bite, though, completely changed my whole perspective on life. Hot Damn, this is delicious flan! And I look at the ingredients to see, indeedy those are all natural, basic, and real food items making this magical burst of flavor in my mouth! 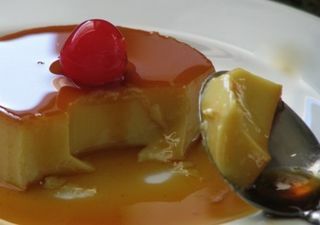 Like the Flan King, this particular flan is rather thick and heavy, but it has a bit more texture, especially towards the bottom where it nicely soaks up extra caramel sauce. Flan fan or not, you can’t deny that Signature Flan makes a tasty dessert! Hi! It’s my first late night blog…Tonight I ended up at Pinches Tacos, which, I have to say, for 8 years now I’ve thought was “Pinks Tacos” based on the fact that the edifice is pink. Yeah, I thought it was kinda vulgar too.. but hey, it’s Hollywood, you never know..! Lo thus, it’s PINCHES taco. What the heck is a PINCHES Taco?? Anyway, I got cheese fajitas with guacamole and flan. 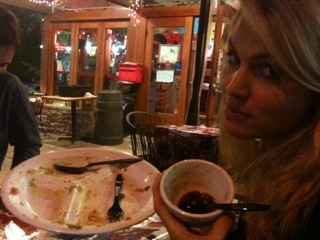 MMmmmm, the flan was pretty fantastic-actually. While it had a rich and slightly eggy flavor the consistency was still seamlessly smooth. The caramel at the bottom was burnt and bitter, lending it a gourmet twist on a normally sugary sweet touch. My friend really appreciated this exotic turn, where as I just kept eating it with one eyebrow raised, wondering if I loved or not. Over all I give Pinch Taco’s Flans a solid 4 cherries! Then our designated driver (very important to have one of those! ), insisted on doing a quick McD’s drive-through for some coffee. Well, excuse me, but your Dessert Darling is NOT about to go through McDonalds and not get a milkshake! I told my friend to surprise me with the flavor. 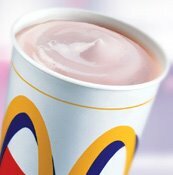 The result was an artificially sweet strawberry milkshake that kindled fond memories of scratch and sniff stickers and strawberry cotton candy. Made with real strawberries this was not. But then again, as much as I’m about eating “real food” (and I am), I kinda dug that I didn’t have real tart berries souring up the batch. Over all, it was a tasty, but perfectly average shake. 2.5 cherries. Perhaps I’ll tidy this blog entry up in the morning… but for now, I’m having jolly time late night blogging…OOoh, naughty me.